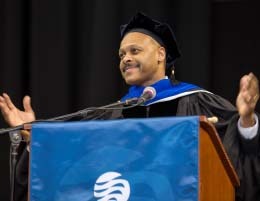 Resilience and relationships are important elements for a successful life and career, said Maurice Jones, addressing about 600 new Tidewater Community College graduates Thursday evening at the college’s 59th Commencement Exercises. He then spoke affectionately about his grandfather, whom he described as the most powerful influence in his life. Despite a near-death experience with bacterial meningitis at the age of 85, Jones’ grandfather survived another 10 years. The lesson, Jones said, was resilience. The classmate he referred to, Katrina Crowe, had spoken a few minutes earlier. A high school dropout who earned her GED, Crowe overcame numerous obstacles en route to graduating with her Associate of Science in Social Sciences. She struggled with her grades, lost her financial aid for a time and had doubts about finishing her degree. The birth of her son inspired her to continue college. She challenged her classmates to make sure their degrees make a difference. “Whether you continue on with your education, enter the workforce and begin your career, or move up in your current career, the most important thing you can do is make sure you put what you have learned on paper to use,” she said. 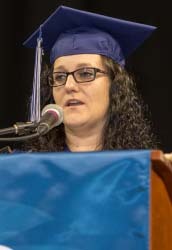 The commencement ceremony, held at the Ted Constant Convocation Center, marked the debut of new caps and gowns for TCC graduates. The regalia is now blue, with a silver stole bearing the college’s seal. Students wore colored cords to denote their degrees or certificates, and honor graduates wore gold cords. Kolovani lauded the Class of 2014 for its achievements. Nearly half of the class earned associate of science degrees, and 37 percent graduated with honors. Flashbulbs and raucous cheers from family and friends acknowledged the graduates’ achievements. After crossing the stage and shaking hands with the president, graduates received TCC Alumni Association pins from Tamara Poulson, alumni relations manager. Garrett Berger, president of the college’s alumni board, welcomed the new members. “Tonight you join nearly 120,000 alumni worldwide who share a common bond in TCC,” he said. “We hope you will embrace this common bond by giving back to those students who will come after you.” Berger, an accountant, started his college career at TCC and transferred to the University of Virginia, where he earned bachelor’s and master’s degrees.